Ancestry, the global leader in family history and consumer genomics, harnesses the information found in family trees, historical records, and DNA to help people gain a new level of understanding about their lives. Ancestry has more than 2.6 million paying subscribers across its core Ancestry websites and DNA data from more than 5 million people. Since 1996, more than 20 billion records have been added to Ancestry’s databases, and users have created more than 90 million family trees on the Ancestry flagship site and its affiliated international websites. Third City and Ancestry DNA reimagined the classic full English breakfast, using our genetic makeup as inspiration. 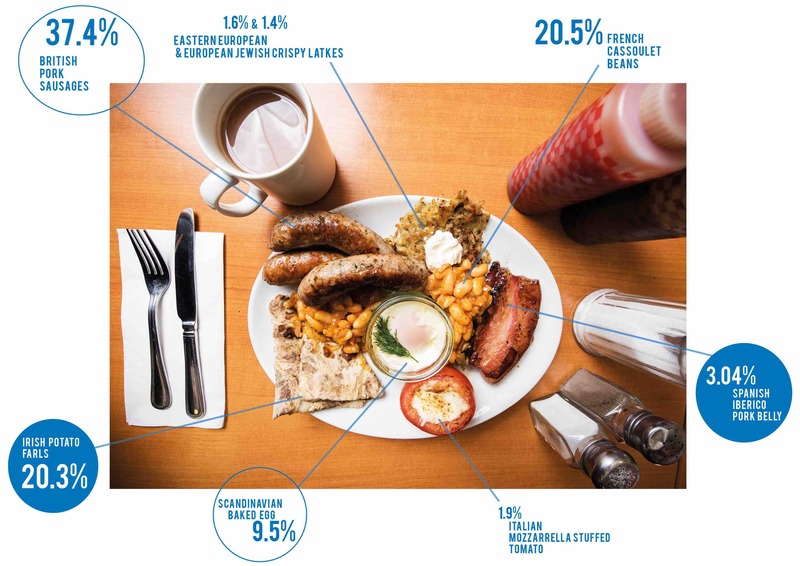 The full English breakfast is a national staple, so what better way to challenge people’s perception of their own identity than to reimagine the breakfast classic based on the DNA breakdown of a typical English person. Working with Masterchef finalist 2017, Steve Keilty we gave the traditional ingredients a new, diverse interpretation. British pork sausages remained, but Steve introduced Irish potato farls, Iberian pork belly, and French cassoulet beans (see below). Photographed and cooked in a traditional British café, the breakfast was cooked for journalists and appeared on MailOnline and The Sun.